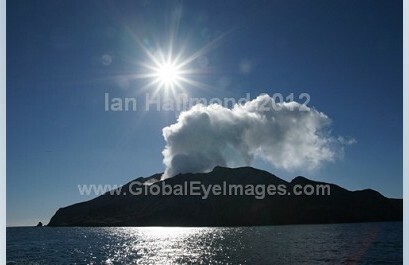 White Island Volcano Photo Gallery. White Island Volcano is a set of stock images from photographer Ian Hallmond.This lightbox contains images of New Zealands only live marine volcano. The White Island volcano is located 50 kilometres off the east coast of NZ's Bay of Plenty region. The images shown here are off the amazing colours of this landscape. A landscape of brightly coloured crater walls and swirling clouds of hot steam. A testament to the active power and forces of nature that make NZ one of the worlds most volcanically active countries. Ian Hallmond Stock Images.